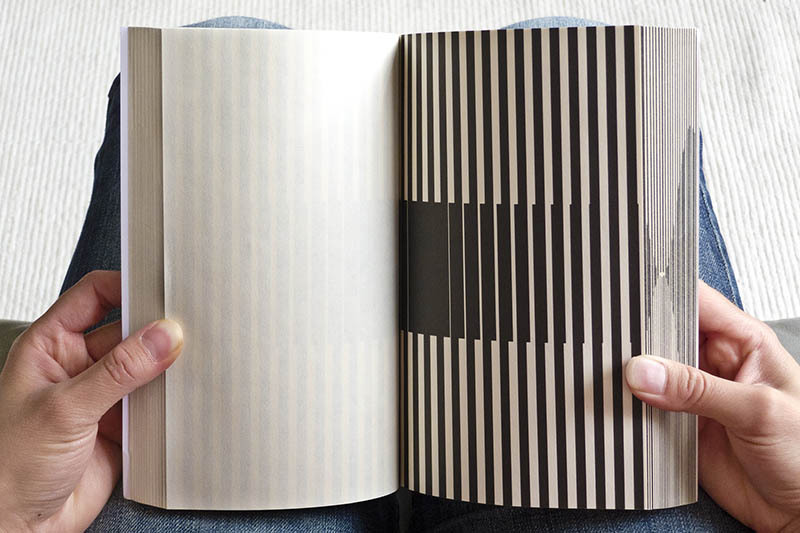 This is a wordless, untitled book (the "Contemplating..." title refers to the covers of the book, not to the book itself), with a flip animation of a Moiré pattern on the pages inside of it. The inspiration came from seeing such a pattern (undoubtedly a screenprint by Leona Engels - who sadly doesn't have a website yet). I wondered if I was looking at an illusion or at something real - and whether or not those two were mutually exclusive. "It depends on what your definition of the word 'is' is," as Bill Clinton would say. This first flash of armchair philosophy led to this book with many covers. You could say it's a different book depending on the cover. All identical on the inside, from a visual standpoint. The only differences between them are the covers. This can be interpreted as an inversion of one of the symptoms of contemporary art: that the interpretation of the art critic is mistaken for the work of art itself, in a poor attempt to redeem otherwise very uninteresting artwork. However, I don't intend for this work to be meant as an ironic jab at post-modernism - that would be fighting fire with fire, which is quite ironic, which in itself is very post-modern, which would defeat the whole point. Irony is also fairly boring, and this work has more to offer than that. The book is first and foremost intended as an aesthetical object, meant to be picked up, flipped through, played with, enjoyed for its visual qualities. The different covers are meant to prime the mind with a title and some information. It intends to show that the cover can change the nature of attention you give the book, which changes the "reading" experience. I believe the cited texts on the back of the covers are all genuinely interesting topics to ponder while meditatively browsing through the book itself, and that the visual experience can then be seen as a metaphor for the topic. And although I do not consider there to be a 'wrong' way to interpret and enjoy the book, that is how I intended this work to be experienced. This also symbolises a relation between the conceptual and the aesthetic - with the conceptual being represented by the covers, and the aesthetic by the book. While a concept can change the aesthetic experience of an artwork, like the cover could change the experience of reading this book, the interpretation is essentially only uncovering something which was already hidden in the pages. While concept and aesthetic need each other, aesthetic is primary in that sense (this idea is blatantly stolen from Iain McGilchrist). You can print these covers from the pdf above. In order to get fitting covers you need to print on A3 sized paper (or bigger, but that's very wasteful), and print without resizing. Some cutting required afterwards. Alternatively, you can mail me your adress, and I will send you a cover free of charge when you order a book. If you live outside of the Netherlands I will ask for a small postage fee though.